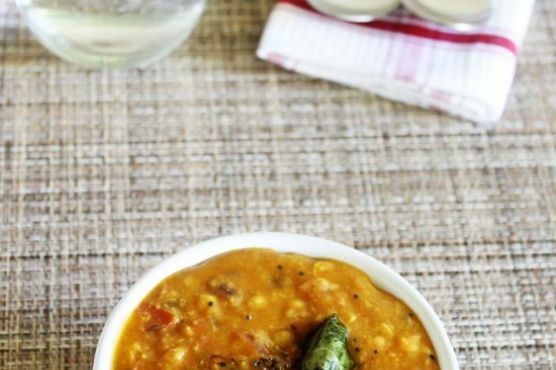 Wash chana dal well under running cold water till water runs clear.Soak it into enough water for at least 30 minutes. More soaking will not harm.Now discard the soaking water. Add dal to pressure cooker along with 1 ½ cups of water, turmeric powder and salt.Cover the pressure cooker, put the weight on, and turn the heat on medium. Let cook for 6-7 whistles. Let the pressure go down by itself and open the cover. It should be soft.Now heat the oil a pan on medium heat. Once hot add ginger paste, garlic paste and green chilies. Cook them for 30 seconds.Then add chopped onions. Let it cook till onions get light brown. Add chopped tomatoes and mix it. Mix it and cook it for a minute. Add extra water if needed to make it as per your liking consistency. Let it come to a boil.Now for tadka, heat the oil in a small pan on medium heat. Once hot add mustard seeds and let them pop. Then add cumin seeds and let the sizzle.Then add curry leaves and dried red chili. Cook for 30 seconds.Immediately add tempering to the dal.